Scores 34 Highway MPG and 26 City MPG! This Chevrolet Sonic delivers a Turbocharged Gas I4 1.4L/83 engine powering this Automatic transmission. WHEELS, 16 (40.6 CM) ALUMINUM, TRANSMISSION, 6-SPEED AUTOMATIC (STD), TIRES, P205/55R16 ALL-SEASON, BLACKWALL. *This Chevrolet Sonic Comes Equipped with These Options *RS PACKAGE includes (BVG) sport body kit, (T3U) front fog lamps, Black Chevrolet emblems, (B6E) sporty rocker moldings, (D59) integrated decklid rear spoiler, (E38) RS lettering, (VWC) Piano Black accented instrument panel, (N35) sport, 3-spoke leather-wrapped with contrasting stitching and Black Chevrolet emblem, flat bottom steering wheel and (B54) carpeted front and rear, deluxe floor mats , STEERING WHEEL, SPORT, 3-SPOKE LEATHER-WRAPPED with contrasting stitching, flat bottom, SPOILER, REAR, INTEGRATED DECKLID, SILVER ICE METALLIC, SEATS, FRONT BUCKET WITH RECLINE AND HEIGHT-ADJUSTABLE HEADRESTS (STD), ORNAMENTATION, RS LETTERING, MOLDINGS, ROCKER, SPORTY, LT PREFERRED EQUIPMENT GROUP includes Standard Equipment, JET BLACK, DELUXE CLOTH SEAT TRIM, INSTRUMENT PANEL, PIANO BLACK ACCENTS. * Visit Us Today *Live a little- stop by Stingray Chevrolet located at 2002 N Frontage Rd, Plant City, FL 33563 to make this car yours today! Scores 34 Highway MPG and 26 City MPG! This Chevrolet Sonic boasts a Turbocharged Gas I4 1.4L/83 engine powering this Automatic transmission. WHEELS, 16 (40.6 CM) ALUMINUM, TRANSMISSION, 6-SPEED AUTOMATIC (STD), TIRES, P205/55R16 ALL-SEASON, BLACKWALL. *This Chevrolet Sonic Comes Equipped with These Options *RS PACKAGE includes (BVG) sport body kit, (T3U) front fog lamps, Black Chevrolet emblems, (B6E) sporty rocker moldings, (D59) integrated decklid rear spoiler, (E38) RS lettering, (VWC) Piano Black accented instrument panel, (N35) sport, 3-spoke leather-wrapped with contrasting stitching and Black Chevrolet emblem, flat bottom steering wheel and (B54) carpeted front and rear, deluxe floor mats , STEERING WHEEL, SPORT, 3-SPOKE LEATHER-WRAPPED with contrasting stitching, flat bottom, SPOILER, REAR, INTEGRATED DECKLID, SEATS, FRONT BUCKET WITH RECLINE AND HEIGHT-ADJUSTABLE HEADRESTS (STD), ORNAMENTATION, RS LETTERING, MOSAIC BLACK METALLIC, MOLDINGS, ROCKER, SPORTY, LT PREFERRED EQUIPMENT GROUP includes Standard Equipment, JET BLACK, DELUXE CLOTH SEAT TRIM, INSTRUMENT PANEL, PIANO BLACK ACCENTS. 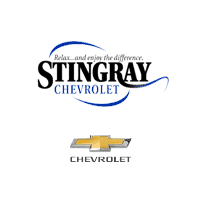 * Visit Us Today *Come in for a quick visit at Stingray Chevrolet, 2002 N Frontage Rd, Plant City, FL 33563 to claim your Chevrolet Sonic!